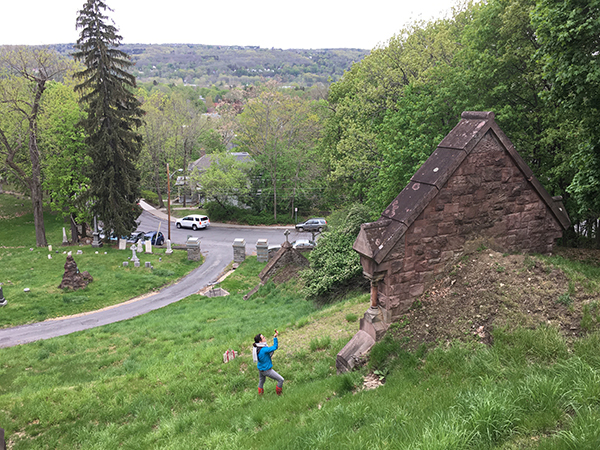 In 2017 Vertical Access was retained by the City of Ithaca to perform a condition assessment of twelve hillside burial vaults located within the Ithaca City Cemetery in Ithaca, New York. 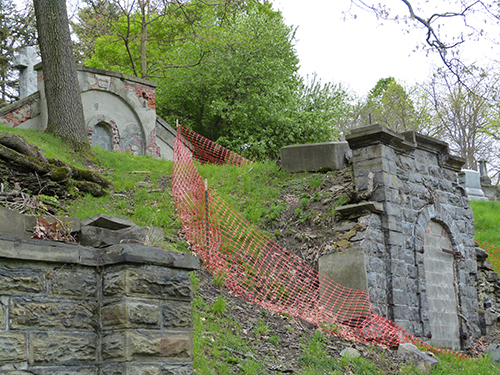 Early this year the City of Ithaca voted to bond money toward the repair some of the hillside vaults. The Ithaca City Cemetery comprises approximately 16 terraced acres on University Hill, between downtown Ithaca and Cornell University, with views over Cayuga Lake and downtown. Vehicle entrances are located at University Avenue, Stewart Avenue, and DeWitt Place. An additional pedestrian entrance is located at Cornell Avenue. Owned by the City of Ithaca and managed by the Parks and Forestry Division, the cemetery is actively used by pedestrians, cyclists, and dog walkers. The City Cemetery is Ithaca’s oldest burial ground, dating from the city’s earliest settlement period in the 1790s. During the nineteenth century, it underwent multiple expansions, evolving into a park-like, formally-designed landscape following the “rural cemetery” movement. 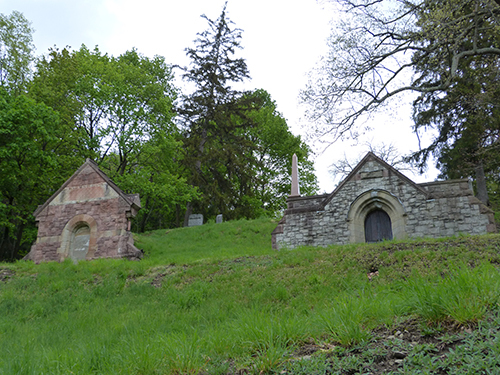 Beginning in the 1860s, hillside burial vaults were constructed by prominent Ithaca families. 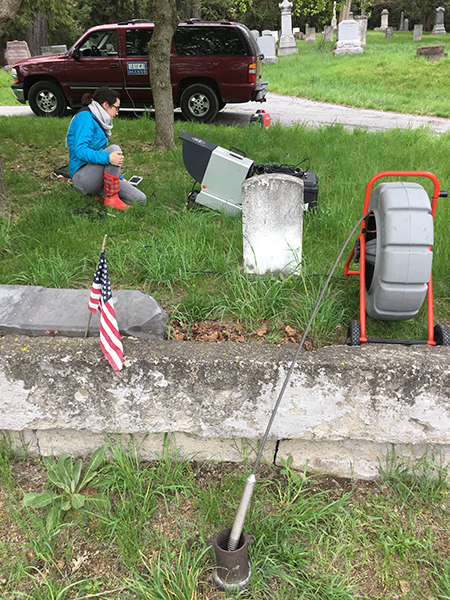 VA historian Kristen Olson conducted a hands-on inspection of the vault exteriors and video documentation of selected vault interiors with assistance from VA partner Evan Kopelson. Ithaca City Forester Jeanne Grace was on site to discuss findings. The vaults range in overall condition from fair to poor. All exhibit signs of water infiltration and structural movement to some degree. Ten of the vaults are constructed with stone exhibiting widespread mortar failure and erosion. Delamination is widespread in units of locally quarried shale known as Llenroc. 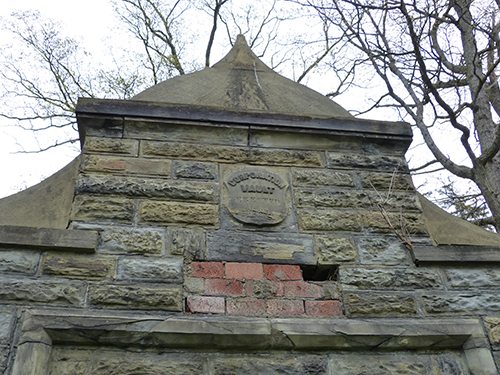 Vertical Access documented existing conditions at all twelve burial vaults within the Ithaca City Cemetery. Notable and representative conditions were documented digitally using the Tablet PC Annotation System (TPAS®), with digital still images linked to condition annotations in an AutoCAD drawing. Additional investigation was conducted at three of the vaults using a GoPro camera mounted to a telescoping pole, inserted through a hole in the door or gap between the door and adjacent masonry, and illuminated with a flashlight. A Borescope was used in an attempt to obtain imagery of the interior spaces of vaults with gaps that were too narrow to accommodate the GoPro, but the footage was not of use since the depth of the masonry at the door surrounds was generally greater than the length of the Borescope. A fiber optic “See Snake”, incorporating a camera with built-in illumination at the end of a flexible cable, was used to investigate the interior of one of the vaults which had an accessible rooftop vent. 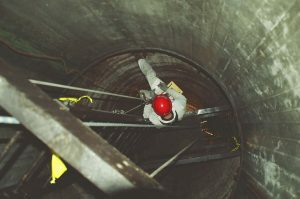 Vertical Access prepared repair recommendations and cost estimates for each vault, with additional emergency stabilization recommendations and cost estimates for the three vaults found to have the most advanced deterioration. While the current funding is inadequate to reconstruct all of the vaults, it will address the three vaults most in danger of collapse as identified in the Vertical Access study. The City’s continued investment is crucial to maintaining this valuable community historic site and greenspace. 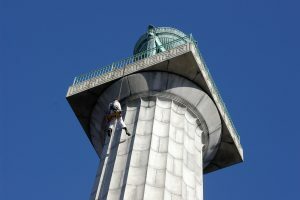 View the latest video in the series, Tourist in Your Own Town, made by the New York Landmark Conservancy, all about the Prison Ship Martyrs’ Monument. During the Revolutionary War, the British held thousands of prisoners on ships anchored in the East River. These prisoners represented all thirteen colonies and at least thirteen different nationalities. The Monument marks the site of a crypt for more than 11,500 men and women who died of overcrowding, starvation and disease aboard these prison ships. Vertical Access performed a comprehensive conditions survey of the exterior granite, bronze brazier and interior brick masonry to help inform the preparation of construction documents for repairs and restoration. More on our work at the Monument.